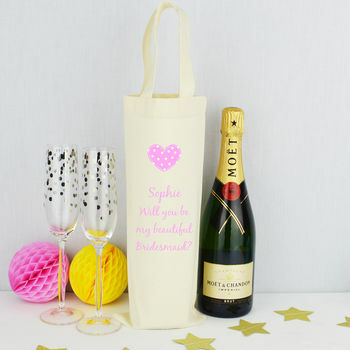 A beautiful personalised bottle bag, the perfect way to ask the special girl/s in your life to be your Bridesmaid. Ask your best friend/s around one evening for a drink and present them all with one of our special 'Will You Be My Bridesmaid' Bottle bag's, can you imagine the excitement that these will create! Pop a bottle of Prosecco in the bag to kick the evening off to a brilliant start! These are a great way to allow them to feel very special and a big part of your wedding day. This bag has two handles so makes it perfect for carrying. Wine is not included with the bag! Should you wish the text on the bag to be in an alternative colour to pink please send me a message with your prefered colour choice, and we will arrange this for you.